Railway Route Selection :- The energisation of GNR & UNR energizes the route selection relay (LR), provided that no conflicting route is set. Thus the basic interlocking is ensured at this first stage itself. 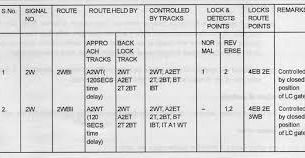 LR is designated after the signal number & with route alphabet, if the signal has more than one route. LR is normally down & picks up when an operation to clear a signal is performed & when the interlocking permits. LR picks up only when the conflicting LR‟s are not energized. Energization of LR operates the points to the desired position. 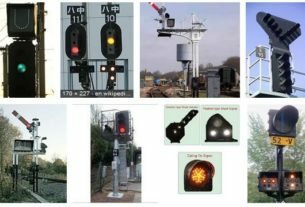 LR front contact is used in route checking (UCR) & signal control (HR) circuits. Once 10ALR picks up it sticks through its own front contact by passing the front contacts of 10GNR and D-4UNR as these relays will drop when the buttons are released. 10ALR should remain energized till such time the train passes the home signal 10 and occupies the first track circuit 10T when 10/C-10 TSR drops and cuts off the feed to 10ALR. 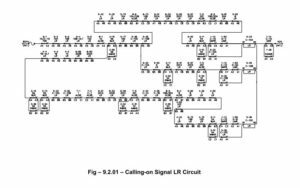 After setting the route and clearing the signal, if it is desired to cancel the signal by pressing 10GN and EGGN, 10 GNR picks up and EGGNR drops with the result N24 is cut off from 1ALR and the relay drops and is normalized. After 1ALR picks up, it sets the route. Points 51, 52, 54 and 56 are set in their normal position and their WLRs de-energize and lock the points in the route. The front contact of the WLR of these points proved in the circuit will cause de-energization of the 1ALR relay. 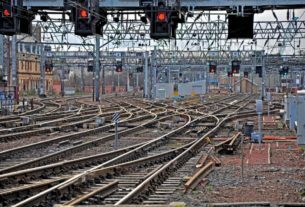 To avoid this contingency, the WLR front contacts of these points are by passed with the front contact of the respective NWKRs and the feed of 1ALR is maintained through these contacts. The circuits of 10BLR and 10B-ALT, LR are also given in this drawing to study and understand the principles involved in the design of these circuits.